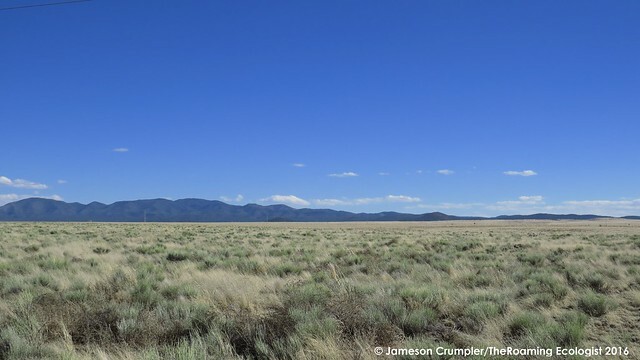 In west-central New Mexico, west of the San Mateo Mountains, along and down the eastern and northern slopes of the Great Divide, lies a high-elevation grassland borne out of the long ago extinction of a lake that met its desiccated end during the final centuries of the Pleistocene. The chief grass here, Blue Grama (Bouteloua gracilis), evolved into its modern day form after expanding its range from its origins in present-day Mexico. This graminoid, like others of its arid communities, has been growing leaves and making seeds and putting down roots for some 12,000 years, arriving on the heels of Lake San Agustin’s desinence at the end of the last ice age, which left behind what is now the expansive, harsh plains, dotted with playa remnants of the old lake. The dormancy-cured grasses are a holdfast to the relatively young sandy loam soils, as the winds race down the mountain slopes and unleash a swirling fury all along this intermontane basin. Thoughts and speech are swiftly removed from one’s personal space here, leaving only the ancient whistling winds to fill the void that has changed from lake bottom to grassland, settling in at 7,000′ above sea level. The air still has a biting chill and spring has not yet arrived. A view photographed to the east of the Plains of San Agustin, near the Very Large Array. Looking south towards the San Mateo Mountains. Note: This post was written in April of this year. Only now have I had the time to get back to managing the blog. Tagged blue grama grassland, New Mexico, Plains of San Agustin, San Agustin Plains, San Mateo Mountains, Very Large Array.